I admit freely to generally liking all Honda motorcycles. Not that I won’t criticize shortcomings on them, but overall I just like the cut of their jib. They build bikes that make the rider feel more confident in their ability. They focus on imbuing their bikes with user friendly torque curves and power bands tailor-made for specific applications. Honda bikes have a unique design and sound aspect too. I can almost always tell I’m riding one instinctively. I bonded with the 2017 Africa Twin I rode over 1000 miles to Tuktoyaktuk in June and I was pretty confident the new CRF450L would be a friend too. I literally jumped out of bed yesterday morning when I saw a FaceBook post from Adventure Honda in Calgary proclaiming that they had just received a demo unit in house I could try on asphalt (sadly no dirt demo). 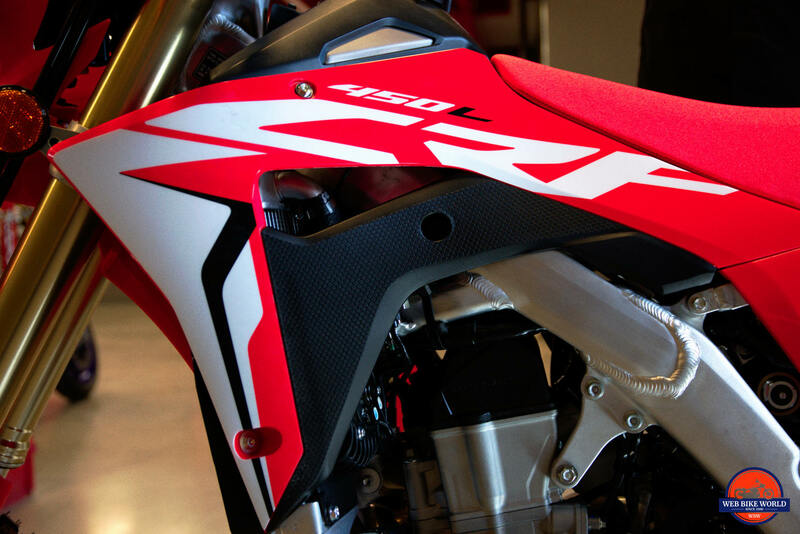 The 2019 CRF450L isn’t perfect, but it’s damn close. This is a very attractively styled dual sport bike whose ample ground clearance, high fenders and plush suspension cry out “take me to a muddy or sandy place to play!!!”. The finish quality is second to none. Everything is as it should be in a high level off road bike. There is an abundance of aluminum, stainless steel and other expensive metals like titanium laid out on the bike which contrast the fiery red and white plastic panels along with stark, black aluminum rims. Honda claims the graphics were designed to be more resistant to peeling caused by abrasion or pressure washing. I’ll believe that when I see it! The headlight is tinted as if to imply this is bike so cool it has to wear shades all the time.